This is how humans get to Mars. NASA has successfully tested the engine that will power its new, massive Space Launch System (SLS) deep-space rocket, reporting no issues across the 7.5-minute duration. This is the third successful test of NASA’s RS-25 rocket engine, and there will be three more in the coming months – all in preparation for when it will combine four of these monsters to fire humans towards Mars. “SLS is going to be the most powerful rocket ever built when it’s done several years from now,” space shuttle astronaut Rick Mastracchio told the press at the event, held at the Stennis Space Centre in Mississippi. As you can see in the footage below, the RS-25 engine is all kinds of awesome. Not only is it stunning in terms of the amount of power it can sustain for the duration of the test, but this isn’t even new technology. Built by US rocket and missile propulsion experts, Aerojet Rocketdyne, the RS-25 is a testament to how long rocket engineers have been killing it, because these engines were once used as space shuttle main engines, and powered 135 missions to low-Earth orbit from 1981 to 2011. Now NASA needs them to fire at much higher performance levels to meet the needs of the SLS – set to be the most powerful rocket ever built. When completed, the SLS will be powered by two five-segment boosters – one of which was tested earlier this month – and four RS-25 main engines. As NASA explains, the solid five-segment boosters are designed to work together with the main engines during the first 2 minutes of flight, providing more than 75 percent of the thrust the SLS needs to break free from Earth’s considerable gravitational pull. Just to give you a better idea of what that would look like, those twin boosters -which are 17 stories high EACH – will burn 5 tonnes of propellant per second to create 3.6 million pounds (1.6 million kg) of thrust to kick-start the mission. 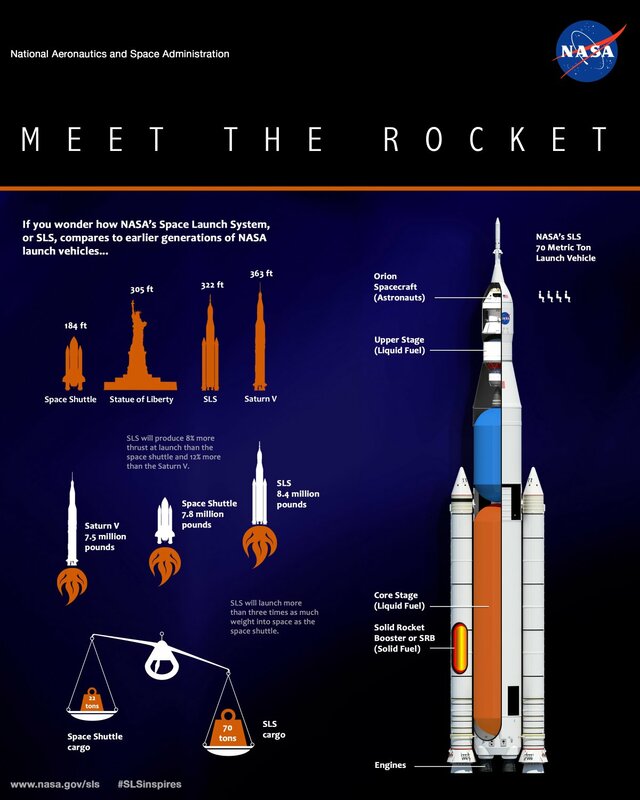 The SLS itself will be taller than the Statue of Liberty, and capable of carrying more than twice the payload weight of any of NASA’S former space shuttles. It’s designed to carry four astronauts at a time on board NASA’s Orion spacecraft, which had its first test-flight back in December 2014. The SLS and Orion will carry humans further into space than ever before, but first they must successfully complete their first unmanned test flight, scheduled for some time in September 2018. In case you weren’t already excited about the future of spaceflight – you should be. With NASA well on its way to building the most impressive rocket humanity has ever seen, and partnering with private space companies SpaceX and Boeing to get all hands on deck, Mars truly is right within our grasp.